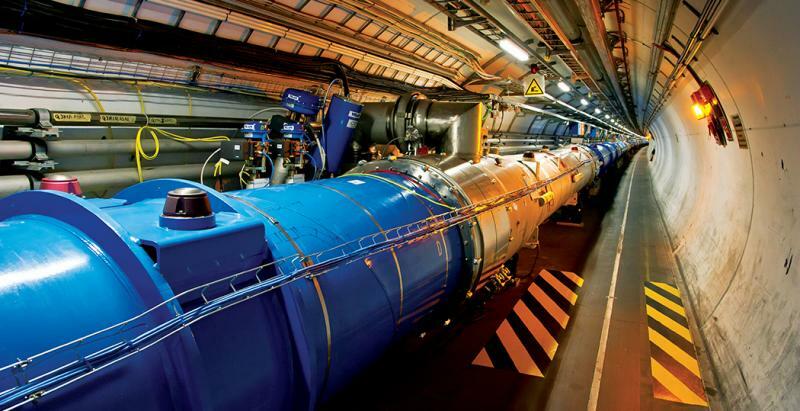 Following its impressive findings regarding the Higgs Boson particle and dark matter, the Large Hadron Collider (LHC) in Cern, Switzerland is on the verge of smashing its way into another dimension. Should the project prove the existence of parallel universes – which could happen within the next few days – it has the potential to change the laws of physics, though quantum physics has been prepared for this eventuality for some time. “Just as many parallel sheets of paper, which are two-dimensional objects [breadth and length] can exist in a third dimension [height], parallel universes can also exist in higher dimensions, said Mir Faizal, one of three lead scientists at the LHC. “We predict that gravity can leak into extra dimensions, and if it does, then miniature black holes can be produced at the LHC. While the LHC has already had the biggest single influence on physics since Einstein, proving the existence of the Higgs Boson “God” particle, creating a miniature black hole, and even simulating the Big Bang, proving the existence of parallel universe could be the greatest scientific discovery ever made. So then only 7 more dimensions until the proof of string theory! Slowly but surely! In pc we can define what zeroes and one means .since we defined them. But if it’s the universe that do the defining ? How do you figure out the language (coding)of the building block of the universe if the base is -=+ instead of 0&1. We assume neutral is useless. What if it isn’t? just how big exactly are these “mini black holes” ? and if something goes wrong , how exactly do you close a black hole ? Because every black hole I have read about seems to be expanding. The LHC has a vacuum inside – essentially, the mini black holes can only expand by consuming each other, eventually no longer have the gravity to keep themselves together against all the other forces acting on them, and collapse. Plus, they’re on an atomic scale, so could never actually damage much, let alone pose a threat.